There's a new version of Google Presentations that has both a new interface and new features that bring it on par with the other Google Docs apps. To try the new version, go to the settings page, select the "editing" tab, enable "Create new presentations using the latest version of the presentation editor", go back to Google Docs and create a new presentation. Google Presentations has an HTML5 rich-text editor created from the scratch by Google and initially available in Google's online word processor. The editor supports character-by-character collaboration, transitions and animations, rich tables with merged cells, drawing charts and diagrams within the presentation and using shapes to link to other sides. 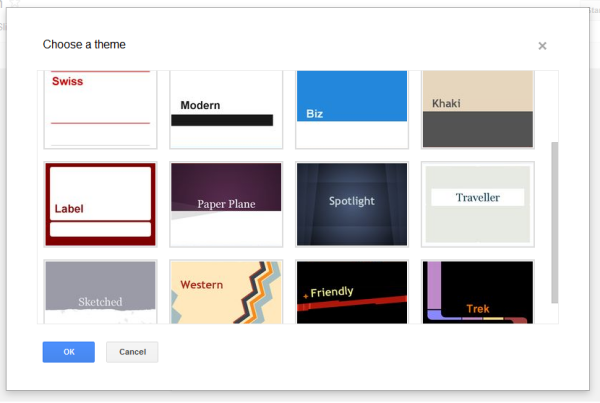 Google Presentations also includes some new themes. 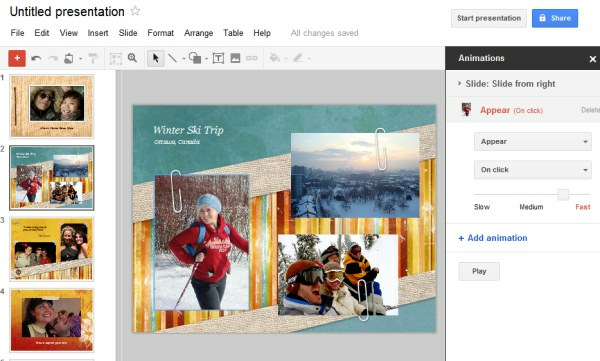 "At this time, it's only possible to create new presentations in the new version of Google presentations. Older presentations will remain in the old format for the time being, and we'll eventually upgrade them to the new format to give you all of the benefits of using the new version. You can copy old presentations into the new version by using the import slides feature or by copying and pasting slides using the web clipboard," explains Google. "With today's launch, the Google Docs suite is now built on a single, solid foundation. Now that the groundwork is in place, you can expect more useful and collaborative features, delivered faster than ever before," promises Google. Best part of this new version? The annoying bar and always-present controls in presentation view are finally gone. The new controls fade out after a few seconds. Honestly, that was my biggest hangup in using Google Presentations. 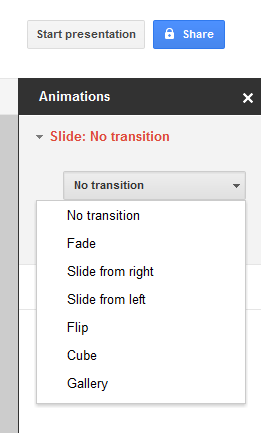 Transitions are pretty boss though. This is awesome... I have not used Presentations (the only docs app i hv not used) frequently due to the absence of Animations and Transitions. Now, it's great... But we need more themes, more animations and transitions. I'm lovin it. Thanks google. Still inadequate for most tasks. Still poor formatting and importing. Still no way to use presentation software on phone/tablet to drive a presentation and look at notes. is this Google presentation much like power point presentation?? can it be integrated in power point... never use this feature before. Nothing exciting except the UI. Has Google gone mad these days after getting into competition with Facebook. They are seeming to be very slow & are coming out with routine things. is the new version super slow or is it just me? Besides the non-educational themes, when I share the link in a MS Word Document it opens in IE 9 Browser in non-editable form. When I send a link in MS Outlook, it opens in the exact same browser in an editable form... New features are not helpful if the presentation can't be easily accessed to edit.